From the author of the no.1 New York Times bestselling novel The Book Thief. The Dunbar boys bring each other up in a house run by their own rules. A family of ramshackle tragedy - their mother is dead, their father has fled - they love and fight, and learn to reckon with the adult world. Markus Zusak’s previous book, The Book Thief, first published in 2005, has spent more than a decade on the New York Times bestseller list, has been translated into over forty languages, has been made into a movie and is one of my favourite books of all time. These facts, except the last one, have made Zusak a household name. It took Zusak thirteen years to write the much-anticipated Bridge of Clay, but he has said in many interviews that he has actually been thinking about this particular story since he was twenty years old. It’s not surprising then that one of the constant themes in his beautiful new novel is the difficulty of artistic creation. This novel is a far-reaching Australian family saga, stumbling back and forth in time, until we are left with the story of five wild and troubled brothers – the Dunbar boys – who are trying to make sense of the world and the return of their father. Told from the perspective of the eldest brother, Matthew, the central narrative focuses on another of the brothers, Clay, and his quest to build something beautiful. Together with his father, Clay is inspired by the work of Renaissance artists to construct a bridge from local materials. Reading this novel is like watching an old black-and-white film; there is not a glance out of place, every move is loaded and linked, and every gasp of understanding reveals a little more about a family torn apart by tragedy and brought together again by determination. To be honest, it took me some time to adjust to Zusak’s writing of this epic tale. It took me time to find the stride and the heart of this novel, but once I was in there was no going back. This is not a novel to be left, bereft on your bedside. As in The Book Thief, there are lessons to be learnt: to hope is to do, to dream is strength, and to remain conscious of desire is human. 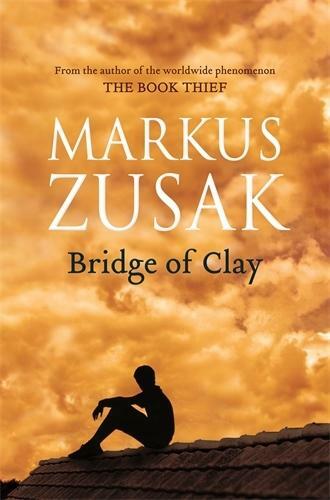 Bridge of Clay may well be Zusak’s finest move.